Martha Berry Digital Archive | Letter from Susan Yound Eagan to Martha Berry. Letter from Susan Yound Eagan to Martha Berry. Letter accompanied donation of $161 as part of the Berry Circle from Atlanta. 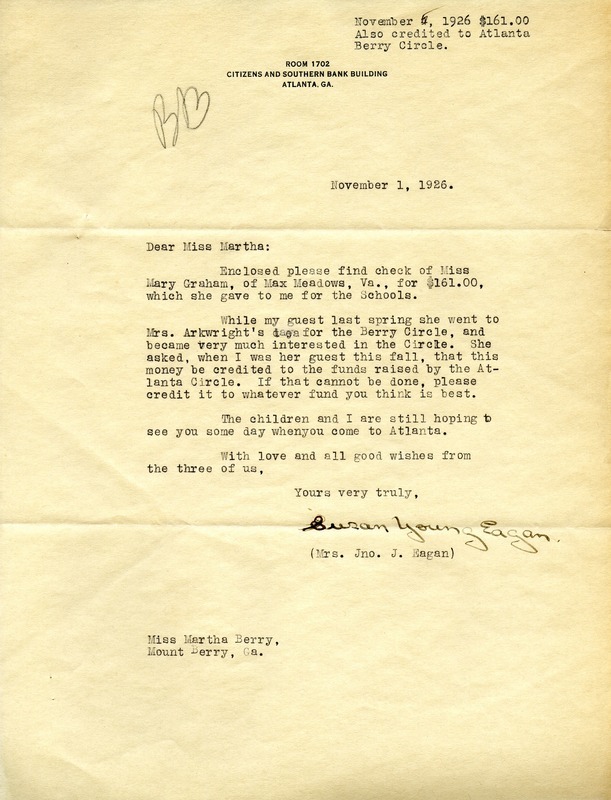 Mrs. Susan Young Eagan, “Letter from Susan Yound Eagan to Martha Berry..” Martha Berry Digital Archive. Eds. Schlitz, Stephanie A., Mandy Tidwell, et al. Mount Berry: Berry College, 2012. accessed April 25, 2019, https://mbda.berry.edu/items/show/1387.